“Sakshar Bharat? vo khatam nahi ho gaya?” (Sakshar Bharat? Isn’t that over?) is Amit Dwivedi’s response when asked what he knows about the Sakshar Bharat programme. Amit is from Oonchadi, a village of 8,000, spread over the forested, remote terrains of Manikpur block, Chitrakoot district in Uttar Pradesh. Oonchadi has a sizeable Kol adivasi population. Yet on the day of the Sakshar Bharat Exam held on 25 August 2013, no Kol adivasi, no woman and no pens were to be found at the exam centre. This year, the National Literacy Mission has been selected for the UNESCO King Sejong Literacy Prize for its Sakshar Bharat Programme, and will receive the award on 8 September, International Literacy Day. The award comes four years after the launch of the only government programme meant for non literate adults. But its implementation at the village level raises several questions about this flagship programme of the government. The Sakshar Bharat programme aims to bring over 7 crore adults into the literate bracket, of which 6 crore will be women, across 410 districts in 26 States/UTs of the country. The timeline for targets meant to be reached by 2013 has now been extended till 2017. These targets are – 80% literacy level at the national level, focusing on adult women’s literacy to reduce the gender gap in literacy rates to not more than 10 percent, and inclusion of SC, ST and minority communities in its fold. The programme is designed to make rural adults literate with 300 hours of learning over a period of 6 months, followed by a certification exam. The programme claims that it has already certified 1.73 crore adults as literate since its launch in 2009. However, in the villages of Uttar Pradesh that were visited, no hours of literacy have been clocked at the literacy centres – in fact, no centres were to be found – yet the certification exam was going on, with some ceremony. The Basic Education Officers (BSA) in Chitrakoot and Lalitpur districts said that the centres would open soon. So first you do the exam, then you begin to learn! Neemkheda gram panchayat in Lalitpur district of Uttar Pradesh saw a sizeable turnout of 25 examinees on 25 August. And for the smooth running of the exam, all the answers were written on the black board. Parwat, from Madanpura gram panchayat in Lalitpur had been woken up that morning and told that he had to sit for the exam. Parwat cannot write his name. He has never been to school. Yet his answer booklet was filled with facts about reasons for growing population, as well as some arithmetic! He belongs to the scheduled tribe Saharia, his name on the registration form meets the SC/ ST targets that have to be met. This exam was a Basic literacy assessment under the Sakshar Bharat Mission conducted by the National Institute of Open Schooling (NIOS). In both Lalitpur and Chitrakoot districts, a target of 10,000 adult examinees had to be met. But neither of the two districts have any Lok Shiksha Samiti (literacy centre) running. So why the exam if no learners have been identified yet and not a single hour has been spent teaching? Vinod Mishra, the BSA of Lalitpur didn’t seem to think the situation was out of the ordinary. ‘Survey toh chal raha hai, centre khulne baaki hain, pareeksha bhi saath me chal raha hai’ (The survey is under way, centres are yet to be opened, exams are happening simultaneously). Meanwhile, the newly appointed Chitrakoot BSA Virendra Kumar Singh is still grappling with names of the villages in his district. The NIOS office could not be contacted for a statement despite several attempts. O.P. Varma, the District Magistrate (DM) of Lalitpur, had an honest confusion about ‘why the central government is running this programme.’ When he was reminded that the DM is the district president of the Sakshar Bharat programme, Dr Balkar Singh responded, ‘Arre, adhyaksh to main bahut kuch ka hoon!’ (oh, I’m the President of many things). Manikpur, Chitrakoot, U.P. A day before the exam she was instructed by the para teacher (shiksha mitra) that, ‘Jo sakshar hain, unko lekar jaana hai aur pareeksha dilwana hai‘ (take those who are literate and get them to write the exam). So, although Sakshar Bharat is a programme for neo-literate adults who are above 15 years of age, graduates and 12-13 year olds were seen appearing for the exam in Oonchadi. 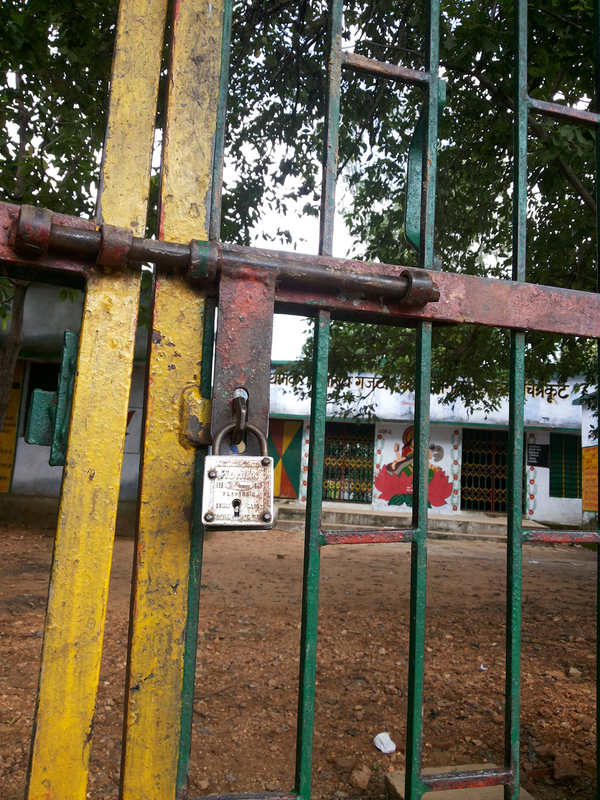 On the day of the exam, when the centre in the primary school was meant to stay open from 10 am to 5 pm, the Aichwara primary school had a big lock on the gate at 12 noon. Chitrakoot district was declared ‘Poorna Sakshar’ (100% literate) in 2001. 12 years later, the newly launched literacy programme in this district raises many questions. On the ground, in the villages of Chitrakoot and Lalitpur in UP, this remarkably well-drafted programme is rife with administrative miscommunication and confused implementation, provoking us to question what lies behind the shining national figures being declared by the programme. 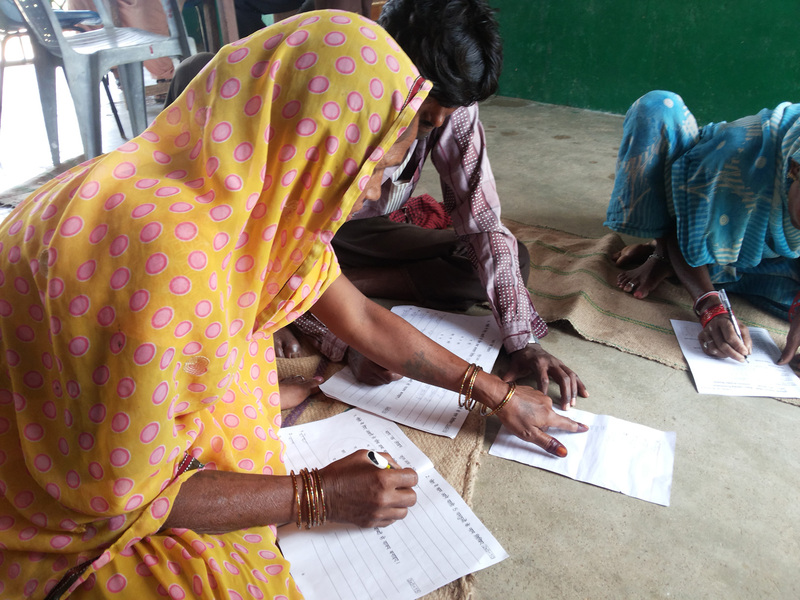 The literacy level in Uttar Pradesh might be looking good on paper, certificates may be handed out to thousands, and the programme might be receiving international accolades this International Literacy Day– but most of the population of Bundelkhand are still not able to recognise the letters on their ration cards.